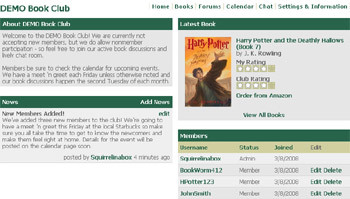 Book Clubs Online - free online book club software featuring forums, chat, calendars, and more. Looking to join a book club that specializes in your favorite genre? Book Clubs Online has you covered! Interested in checking out what people have to say on your favorite book? Book Clubs Online has you covered. Want to create your own book club, complete with forums, chat, a calendar, and more? Book Clubs Online has you covered! That's right, Book Clubs Online is your source for everything book club related. Registration is quick, easy, and 100% free. Book clubs come with a full set of club management features - including an informative homepage, forums, a chat room, calendar events, and more. Keep in mind, all features on this site are 100% free with no strings attached. With club news, member lists, an about section, and more - your club homepage serves as a great introduction for prospective members as well as being a useful source of information for existing members. Your club's latest book will be prominently featured, displaying your rating as well as your club's average rating, with quick links to that book's latest topics. When you create an account here at Book Clubs Online, you'll be able to create and join as many clubs as you'd like. Your profile page will display all clubs you are a member of as well as any messages you've sent or received. That's right! Book Clubs Online has a messaging system built in! No need to give out your email address if you don't want to as you can sent messages to people through the website, keeping your email private at all times. This site is currently in beta, which means that I'm still working on a few features that should hopefully make their way to your clubs soon. I can't give you any details just yet, as it's all very hush-hush. Anyway, there's a lot more information to be had, so be sure to check out the about page and the F.A.Q.